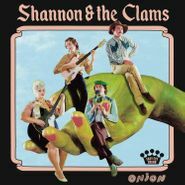 Shannon & the Clams do it again! Onion should prove to be thoroughly satisfying to fans of the throwback gospel-tinged garage group. Produced by Dan Auerbach, these candy-coated tracks are a joy to listen to. Shannon Shaw’s growlingly romantic female vocals add a rock ’n’ roll edge to the proceedings, while Cody Blanchard’s swooning ‘50s crooner vox showcase the softer side of the band. Onion is a delight.